This Water slide rental is a Ton of Fun for kids! This is our 16' Tropical water slide rental that is 35 long x 20 wide and '16 tall. This water slide can accomodate children from the ages of 2 to 15 years of age. 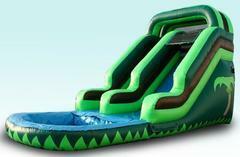 This is a great water slide for the budget concious and for those that have a smaller area to set up a water slide. Don't be fooled by it's size this is still a large water slide and a ton of fun. This water slide has bright colors and a very nice sized Pool at the bottom. This is a front loading water slide so you can watch the kids go up and come down on the same side. The kids will climb up the slide on the left hand side and once at the top they make their way to the platform from which they slide. At the top there is a misting hose that keeps the slide surface wet and keeps the slide cool and fast. The children can slide down the water slide and once at the bottom there is a large pool that they splash down into to complete the experience. They usually go right back up to the top and start the process all over again. In addition to the tarps we lay under this water slide the pool is designed to keep the kids on the slide and out of the grass and dirt, so their feet remain clean and so does their party experience. Be sure to add Sno Cones or Cotton candy to their fun and add some tables and chairs to accomodate your guests.